Would we donate it to their permanent collection after the show? How exciting?! Our quilt top was still under construction, but here was an incredible offer. The museum’s upcoming exhibition is called Between the Layers: Art and Story in Tennessee Quilts, and it opens Friday, Feb. 8. Our modern basket quilt, which finished at 69” x 91”, will be on display for several months, and then it will join the museum’s collection. The quilt will take a short break from the exhibition to hang at QuiltCon 2019 (also in Nashville) from Feb. 21-24. It all started with a letter from Knoxville Modern Quilt Guild. Our modern basket quilt design was inspired by an antique quilt in this book. 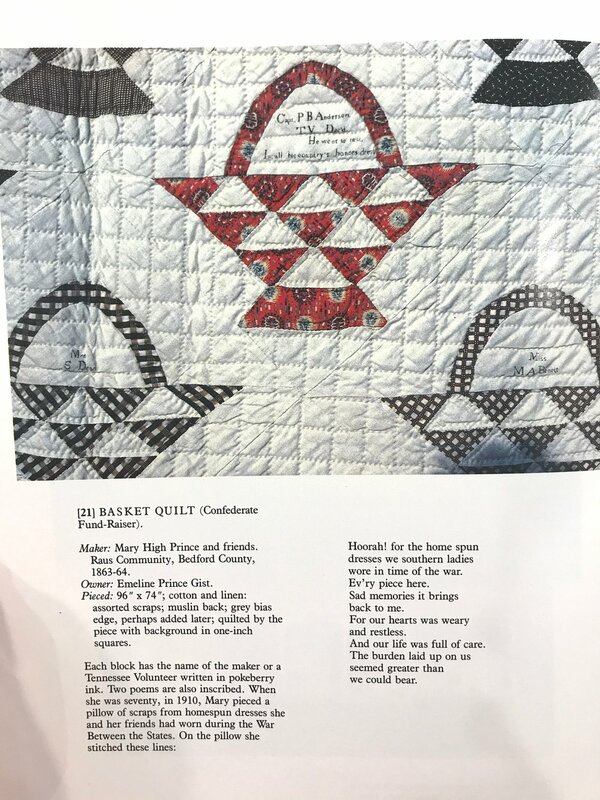 In June 2018, Michelle Bolt wrote to tell us that her fellow Knoxville MQG member—and prominent quilt historian—Merikay Waldvogel was working with the museum on an exhibition of Tennessee quilts. Back in 1983, Waldvogel teamed up with Bets Ramsey of Chattanooga to survey and document nearly 1,500 quilts made in our state. Around 30 of them are featured in a book the women co-authored called The Quilts of Tennessee. Several quilts from the book are included in the museum’s exhibition. 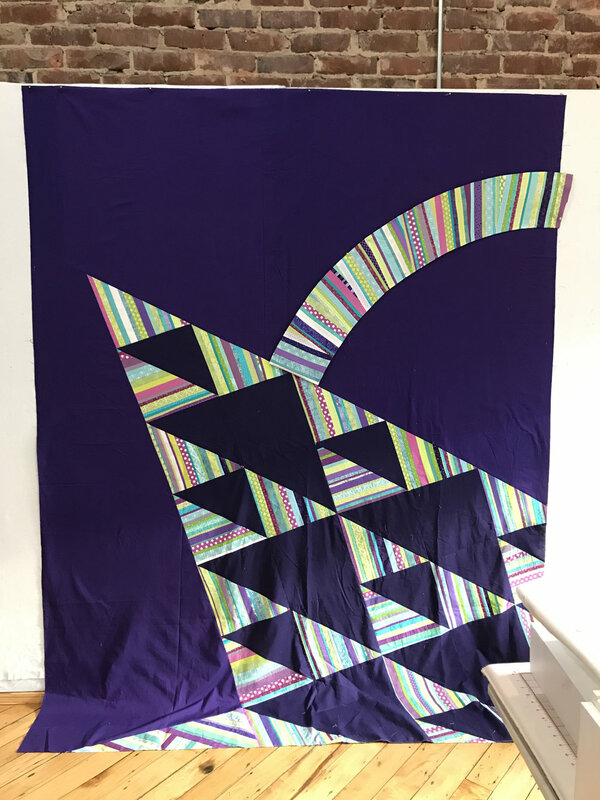 Michelle invited the modern guilds in Chattanooga, Memphis and Nashville to join Knoxville and make a quilt inspired by one of the antiques in the book. These quilts would hang at QuiltCon as part of the international Modern Quilt Guild’s QuiltCon Charity Quilt Challenge, where they would help promote the museum’s exhibition. We accepted her offer enthusiastically and got to work. Have you ever seen a modern basket quilt? As the design team thumbed through the book to decide which quilt to use as our inspiration, this question posed by Audrey Workman and Mary Keasler struck a chord. No, none of us had ever seen a modern basket quilt! The Quilts of Tennessee features several geometric quilts made with bright solids, all of which appealed to the design team. They’re a stark contrast to the scrappy basket quilt attributed to Mary High Prince and friends, which was made in Raus, Tennessee, in 1863-1864 as a fundraiser for the Confederate Army. I wasn’t immediately convinced the basket quilt would be the best inspiration to choose for our design. 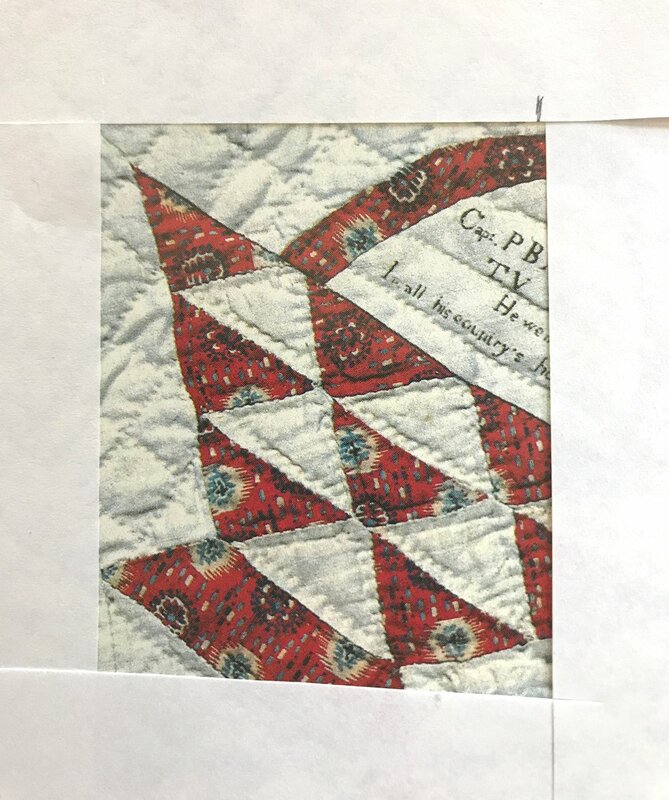 But when Jean Larson created a paper frame and laid it on top of the photo to suggest our way forward, everyone agreed we saw the hallmarks of a great modern quilt! Our design combines a modern aesthetic with historic practicality. 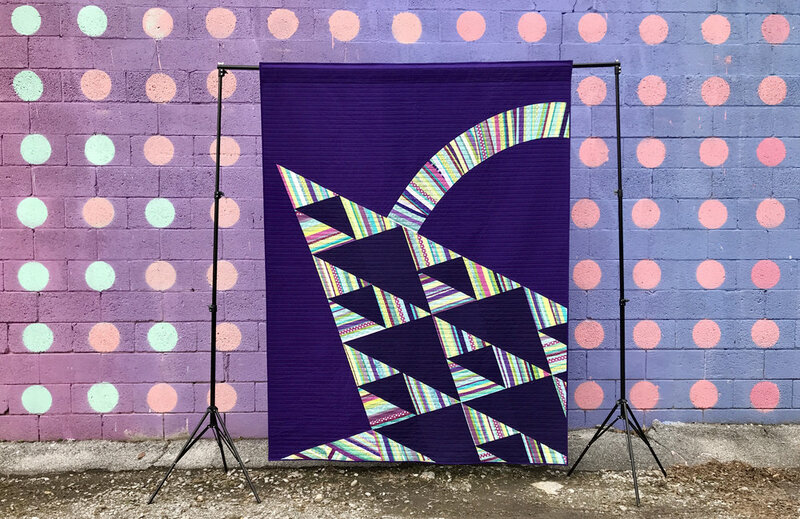 This digital mockup of our modern basket quilt was made by Kelly Spell using affinity photo. 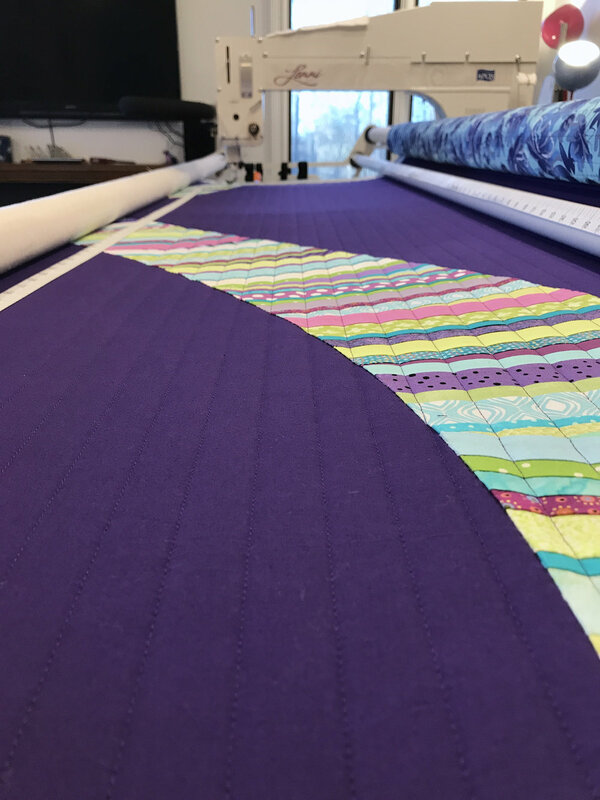 Since the theme of this year’s QuiltCon Charity Quilt Challenge was tiny piecing, we decided to feature long, thin strips in our design, as those would be easy for guild members to piece at home. Mary sewed a sample block, and I used a photograph of it to create a rough digital mockup of our modern basket in a program called Affinity Photo. Rather than buy new fabric, we decided to make do with what we had on hand. The guild already had background and backing fabric, as well as batting, thanks to previous donations. We asked guild members to donate fabrics from their stashes to make the strips. Several volunteers assembled the kits, which were distributed at our September 2018 meeting and sewn at home by guild members. Beverly, Patti Ann, Kelly and Mary sort strips into kits. Assembling blocks on an angle can be a tricky business. But we were confident in Jean’s engineering and quilt-math skills. With the completed strip blocks in hand, the design team began piecing the top together in October 2018. Jean works out the math and engineering required to construct the quilt top. It took several sessions (well into December 2018) to complete the flimsy. The trickiest part of construction was the handle. Audrey wisely recommended we use the sew-and-turn method of applique, which made for quick and easy work using a sewing machine. In January, I finished the quilt with straight lines set 1” apart. Jean and Audrey arrange blocks on an angle. Audrey sews strips to the background fabric to make triangles. Mary and Jean determine the desired height of the quilt. Our progress after day one. Jean determines how to cut the background fabric to keep it on grain. We used freezer paper to create a template for the handle. Mary sews strips to create the handle. We used the sew-and-turn method of applique on the handle. The handle was attached to the quilt top using monofilament thread and machine applique. Kelly quilted the top using her longarm machine. Kelly made this custom label using her computer printer. Now our quilt will live at the Tennessee State Museum. Many thanks to Merikay and Michelle for kickstarting this adventure, and kudos to all of the guild members who worked on the quilt. They are: Pat Barber, Sara Bradshaw, Sheila Edwards, Gerry Haywood, Ann Hurley, Gail Johnson, Mary Keasler, Theresa Kitchell, Jean Larson, Catherine Price, Stephanie Quesinberry, Donna Rand, Kelly Spell, Karen Sperry, Patricia Steadman, Martha Steele, Leslie Wade, Helen Wiley and Audrey Workman. The quilt will be on exhibit at the museum from Feb. 8 until QuiltCon, when it will take a brief jaunt across town to hang with the rest of the QuiltCon Charity Quilt Challenge quilts. The quilt will return to the museum Feb. 25 for the remainder of the exhibition. Between the Layers runs through May 27. Sixteen guild members who worked on the modern basket quilt pose with it at the January meeting. To complement the show, ChattMQG members will participate in two demo days at the museum. On Saturday, Feb. 16, and Saturday, April 20, we’ll show samples of modern quilts to museum guests, and demonstrate modern quilting techniques. For more information about the exhibition and related events, visit www.tnmuseum.org.